Priced: $1,100.75 - $1,295.00 Rated: - 4 stars out of 5 by 1 review. Northern River Supply Fat Cat Cataraft Frame-72Wx120L - NRS Fat Cat Cataraft Frame - The NRS Fat Cat cataraft frame gives you plenty of room for gear and also allows a passenger to sit in a high back seat. Pile on the bags and passengers for long multiday trips while retaining your ability to respond to changing river conditions. The Fat Cat frame allows great flexibility in rigging options. Extra-long side rails provide ample room for a cooler or drybox, plus passengers and gear bags. 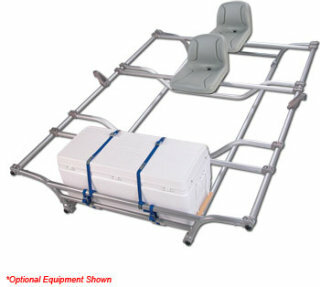 The modular frame breaks down for easy transport, and LoPro fitting make assembly easy. The NRS Fat Came cataraft frame also includes two seat bars with high-back seats, two footbars, one crossbar, and adjustable oar mounts. Carry your gear and passengers in style with the NRS Fat Cat cataraft frame. Holds plenty of gear. More importantly, it provides a seat for my wife, eliminating some jealousy.